Situated in outback New South Wales, Broken Hill is surrounded by semi-desert and borders close to South Australia. A mining town originally sourced for its large deposits of silver, lead and zinc minerals, Broken Hill is now home to a range of attractions and art enthusiasts. From the Albert Kersten Mining & Minerals Museum, home to the iconic ‘Silver Tree’, to the Sulphide Street Railway and Historical Museum, there is plenty to explore and learn about the town’s roots. If art takes your fancy, head to the Broken Hill Regional Art Gallery and be sure to make time to take a stroll to see the twelve enormous sandstone sculptures against the breathtaking backdrop of the Living Desert Reserve. Feel welcome at one of the hotels offered by AccorHotels and our partners in Broken Hill. 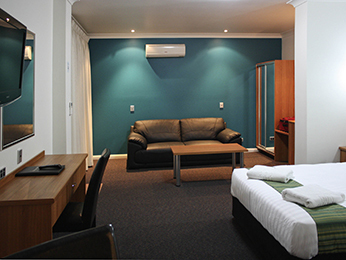 Discover our hotels in Broken Hill for your next business trip, family holiday or weekend break.